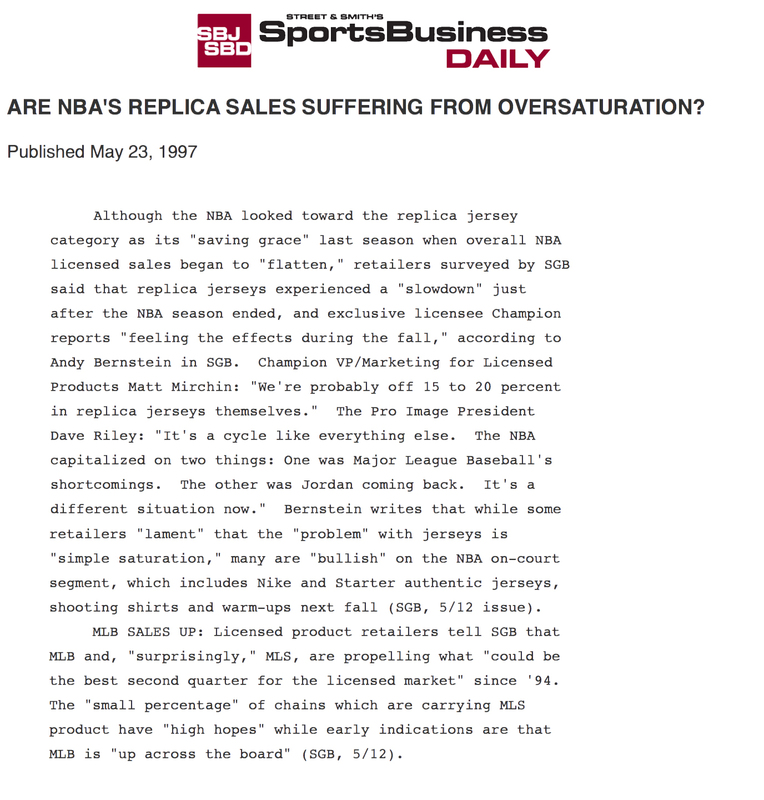 During the 1995-1996 season, NBA licensed apparel sales began a multi-year decline. The reason for the decline was four-fold: fashion trends were just starting to move away from sports apparel and towards casual clothing from retailers like Gap and Abercrombie, the market was saturated with jerseys from the NBA’s limited pool of marketable superstars and teams (the Bulls and Rockets won every title from 1991 through 1998), the NBA was undergoing a cultural shift with up-and-coming superstars like Allen Iverson and Kevin Garnett who weren’t popular with casual fans, and the bounce the NBA had experienced from Major LeagueBaseball’s strike in 1994 had leveled out . During the initial decline, replica jersey sales were still strong and helped negate declines in other NBA licensed apparel. But by the end of the 1996-1997 season, Champion was experiencing a 20% decline in replica jersey sales. With Nike and Starter now producing on-court apparel for the 1997-1998 season, Champion needed to focus on increasing sales of its replica jerseys. 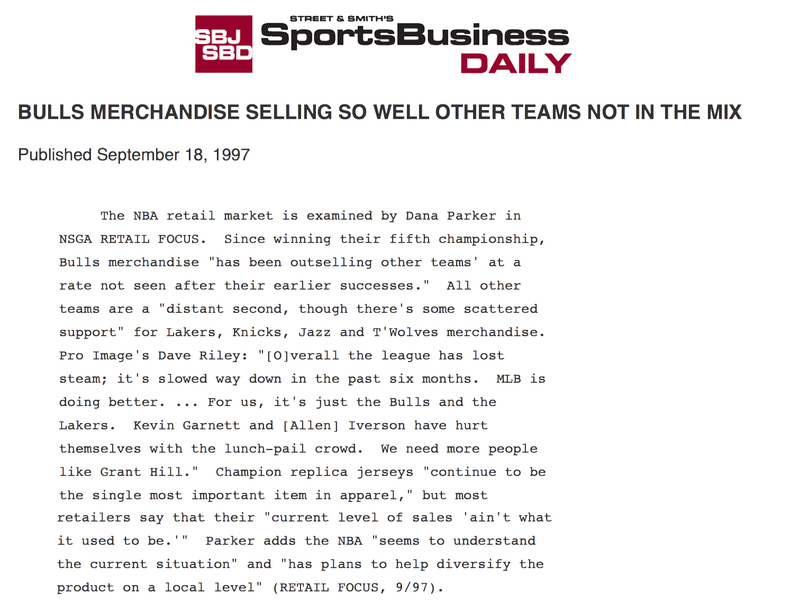 The 1997 NBA draft was lackluster (despite Tim Duncan being the #1 pick), so Champion couldn’t drive sales through rookie jerseys. Jordan was back and the Bulls were putting together another three-peat. The market was already flooded with Bulls jerseys, so Champion couldn’t capitalize on sales generated from the crowning of a new NBA championship team and bandwagon fans. A couple of interesting things to note. Patrick Ewing was named an All-Star starter in 1997, but did not play. Dikembe Mutombo started the game in Ewing’s spot, but Champion still honored Ewing for this collection rather than Mutombo. Also, Shawn Kemp was still on the Sonics for the 1997-1998 season and played in the 1997 All-Star game for the West. But prior to the 1997-1998 season Kemp was traded to the Cavs, so Champion printed his special gold jersey with his new team rather than the Sonics. 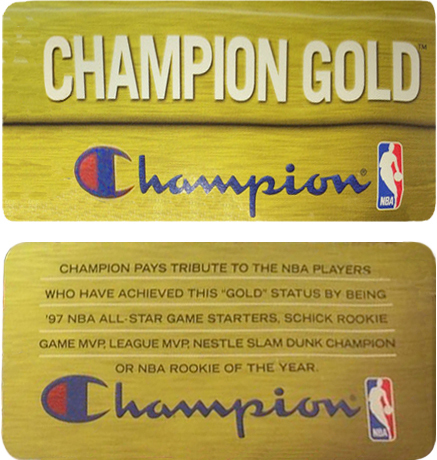 This was the only year Champion issued the limited edition “gold” collection, which means it didn’t sell that well. Today, these jerseys are pretty difficult to find (the shorts are extremely rare). The Michael Jordan jersey is the most common, followed by Hill, Hardaway and Iverson. The John Stockton jersey is probably the hardest in the collection to find (I’ve only seen it a couple of times in 15 years of collecting), followed by Olajuwon and Malone. 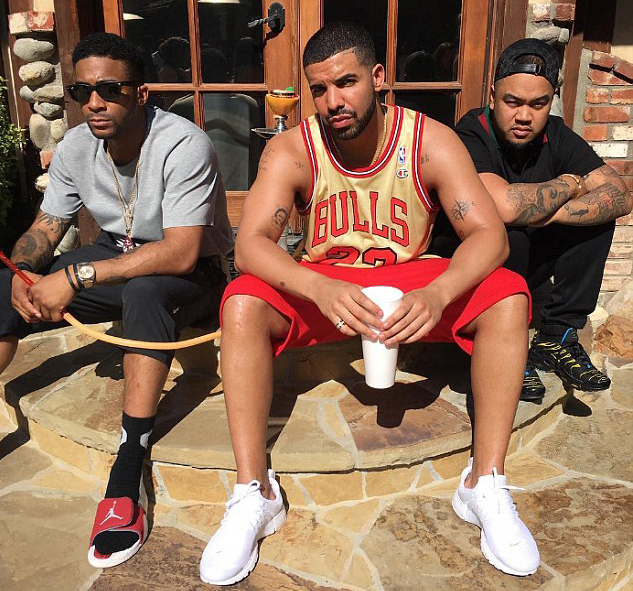 This past Memorial Day, Drake posted a photo on Instagram of him wearing a gold Jordan jersey. Since then, the demand for these jerseys has skyrocketed. A year ago you could get a Jordan gold jersey for around $50. Now they are going for $250+. These jerseys were made in the USA, so the jock tag and collar label should reflect that. Also, since these didn’t sell well and there was deadstock inventory leftover, you’ll see these often come up for sale with the tags still attached. However, you don’t often see the Champion Gold tag attached. I have a feeling once these jerseys didn’t sell and ended up in factory stores and on clearance racks, they were retagged. So if you are an avid collector and pay a premium for deadstock jerseys with tags attached, you might want to make sure the Champion Gold tag is included. Champion failed to recognize that trends were shifting to “on-court” apparel. Since the market was oversaturated with Champion’s heat-pressed nylon replicas, fans looking to stand-out from the crowd were willing to pay premiums for sewn tackle-twill, polyester mesh authentic jerseys. Nike recognized this and eventually released the Swingman, which was a happy medium between expensive on-court authentic jerseys, and cheap printed replica jerseys. Welcome back! Love the website, thanks for keeping it going. Question: Were there ever retail Authentic Champions produced without an NBA patch on the shoulder? In particular, I am trying to figure out if a 1992 Barkley Sixers #32 (he wore 32 briefly to honor Magic) with no NBA patch is legit. Thanks for any help you provide. Thanks for checking out the site! This is tough one to answer, as I have seen both Barkley #34 and #32 authentic Sixers “falling star” jerseys (1991-1992 season) without the NBA logo. Normally I would say not legit since the whole point of an authentic jersey is to be exactly what the athletes wear on the court, and the NBA logo on the left (sometimes right) shoulder is essential. But this is an instance where there might be an exception. Here’s what I know….the Sixers unveiled the new uniform design at the start of training camp on October 3, 1991. This was Champion’s first uniform that they designed in-house since assuming the NBA uniform license a year earlier (at the start of the 1990-1991 season). At the opening of the 1991-1992 training camp, Barkley was presented with his normal #34 jersey for a photo op (jersey has the NBA logo). On November 7, 1991 Magic Johnson announces he has HIV and a few days later on November 12, 1991 Barkley announces that he is switching to #32 in honor of Magic. On November 15, 1991 Barkley wears #32 for the first time against the Celtics, and would wear it the remainder of the year before being traded in the off-season to the Suns. Champion only made replica Barkley Sixers “falling star” jerseys in #32. With all of the being said, the only authentic jerseys Champion sold for retail during the 1991-1992 season were Michael Jordan, Isiah Thomas, Magic Johnson, Larry Bird, Patrick Ewing and David Robinson. From my research, Barkley Sixers authentic jerseys were never produced or sold at a retail level (in fact, for the three years the Sixers wore the “falling stars” design, Champion never released an authentic Sixers jersey for retail). But given that the Sixers redesigned “falling stars” uniform was Champion’s first crack at design, prototypes/samples probably made their way into the market at some point (employees from the design team took some, marketing team used some as retail display pieces, etc). So it’s possible the Barkley jerseys that are out there are samples and not having the NBA logo was to signify they were sample pieces and not for resale. I’ve only seen non-game-worn authentic Barkley “falling stars” Sixers jerseys come up for sale like three times in 20 years, so there aren’t many out there which reenforces this theory. And if they aren’t samples, then they are just after-market customizations by someone who got a hold of blank jerseys at some point (again, Champion produced this style of jersey for three seasons from 1991-1992 through 1993-1994). So in conclusion, they aren’t legit based on the fact that they were never produced for or sold at a retail level. They could possibly be super rare samples, but they could also be after-market customizations. And worst case, they are complete counterfeits. As a collector, I wouldn’t buy one. Hope this helps! Thank you for the thorough response! Looking forward to your gallery updates. May I be the first to say, this post is gold!! The write up is an education, as always, and I can only agree with you that the Stockton gold jersey is undoubtedly the rarest of the bunch. I knew they existed but have never seen one for sale or in the flesh in my life. Wonderful photos too and I’m looking forward to your next post. Hello friend I’m Rodrigo from Chile. Please, please make a post on the collection of all NBA@50th Champion jerseys made. A lot of people including myself would really appreciate this info. Ask and you shall receive (even if it’s 4 months later). NBA at 50 gallery is posted in the Special Edition section. I’ll be writing some blog posts shortly addressing the collection. Really grateful for all the time and effort you put into this site, thanks, I will be checking out the NBA @50 section shortly! Can i follow you on social media ? Thanks for checking out the site. Unfortunately I’m not on social. I already have difficulty finding time to finish this site (it’s like 4 years in the making) let alone keep up social media. But maybe once I finally get this completed I’ll start an Insta or something. Hey! Thanks for doing this.. never give up! 🙂 I love this site and makes me more proud for my Champion NBA jersey collection. One question for you. Champion never made any jerseys in korea right ? So the jerseys with the tags with”made in korea’ are fake. Thanks! Greetings from Hungary! Champion actually did produce jerseys in Korea during the end of their licensing deal in 2001-2002. At that time they were only producing authentic for 8 teams (Atlanta, Charlotte, Los Angeles Clippers, New Jersey, Orlando, Philadelphia, Phoenix, and Utah), and all the authentics were made in Korea. As for replicas, some were made in Korea and some still made in Mexico during the 2001-2002 season. Hello, I have a Larry Bird Jersey that the tags say made in Korea. Is it legit? Probably not legit, Bird retired before Champion started making jerseys outside of the US (he retired after the 1991-1992 season, which was the first season Champion started producing replica jerseys for retail). But, Champion did keep producing Bird jerseys for several years after his retirement due to his popularity and the fact that it appears Bird allowed them to keep licensing his name (same with Magic Johnson). So you will see Bird replica jerseys with “assembled/made in Mexico” tags. But Champion didn’t start producing jerseys in Korea until the end of their licensing run starting in the 2000-2001 season and that was only for select teams (and did not include Boston). Hi, nice article! i am confused about the champion AU jersey for iverson rookie year. i saw the pro cut version with gold nba logoman, and also the AU version with regular color of nba logoman but that AU version has two tags on bottom:left one is the team logo and right one is size tag. people kept telling me that any iverson rokkie AU jersey with regular nba logoman is DIY or fake. is that true or there is indeed an official version of regular AU version with regular nba logoman. thanks! Since Iverson’s rookie year in 1996-1997 was the last year for the design of that style of Sixers jersey, and since that was the 50th Anniversary season of the NBA, all authentic jerseys should have the gold NBA logo. 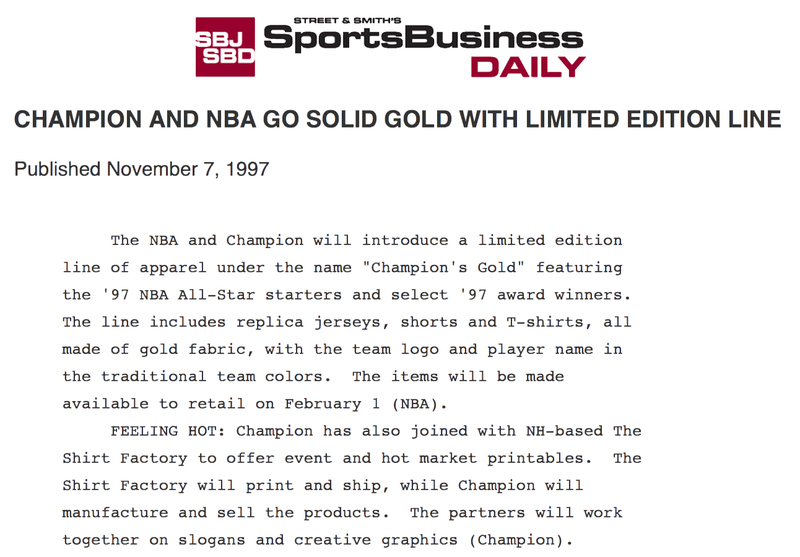 The retail version of the Iverson jersey should have the gold NBA logo, although there is a possibility that maybe if any were issued immediately after the 1996 draft (Summer 1996) that maybe they wouldn’t have the gold logo (assuming Champion was using old jersey stock with regular NBA logo to get jerseys to market quickly). I don’t know that to be the case and personally I would only buy Iverson’s rookie authentic jersey with the gold NBA logo. As for Procuts, I don’t touch those because counterfeiting is rampant. That being said, here are some rules: any legit Procut jersey from 1996-1997 season would have the gold logo. And any Procut jersey would NOT have a collar label. Also, any Procut would have the body length on the left jock tag label. A true Procut is supposed to be the same size the player wears on the court (so for Iverson’s rookie year that would be a size 42 with body length +2). If it’s not the same size a the player wore on the court, then someone just took a blank Procut and letter kit and mashed them together (so that’s semi legit, but not a true Procut). Without the body length listed, then it’s a complete fake. Starting in 2012, a couple of sellers on Ebay started flooding the market with fake Iverson rookie Procuts, most new with tags. Let’s just say most people in 1996-1997 who bought legit Iverson rookie athentics were wearing them and cut the tags off. And there wouldn’t be that much deadstock with tags laying around since Champion knew the design was going to change for the 1997-1998 season. So rule of thumb, if you see a lot of a players authentic jersey floating around with tags still attached, it’s fake. So there are a ton of fake dual-tag/Procut Iverson jerseys out there…I still see them all the time on Ebay. Love your site, great stuff! PS: M&N just did a similar series of jerseys but they also released gold shorts, did Champion make shorts as well back in ‘98? The limited edition Champion Gold apparel line did include replica shorts. They are extremely hard to find. Hey Brother. You need to start monetizing your depth and breadth of knowledge. Quick question… Did champion produce jerseys from the 1988 olympic team to sell to public around the 88 or 92 olympics? I found a Dan Majerle replica jersey on Ebay that looks 100% legit. Did they produce 88 olympic jerseys around the 92 olympics since the 92’s were so popular? Or did someone get a blank and screen print their own? (saw a couple on ebay actually.) Any info would be greatly appreciated. Thanks man! 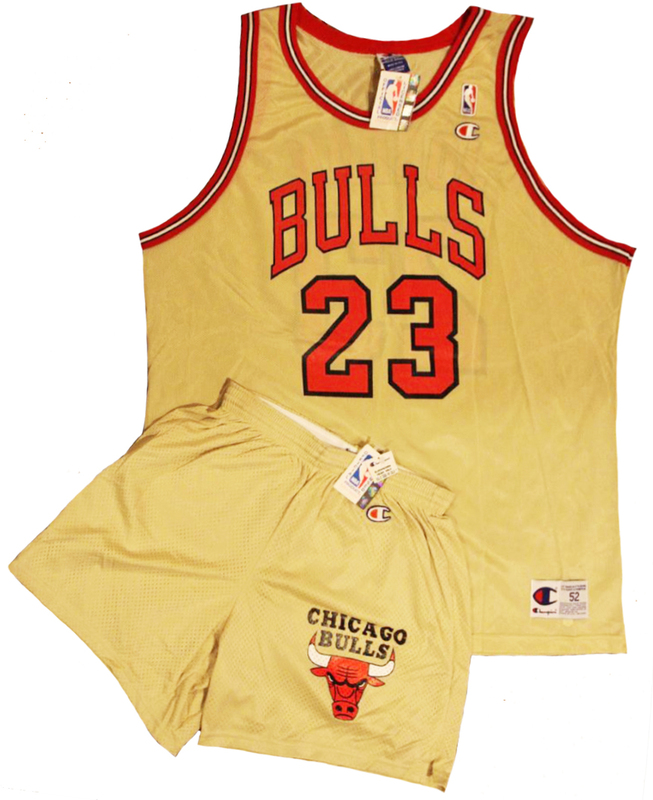 Champion didn’t start producing replica jerseys until late 1991 (they became the exclusive uniform provider for the NBA starting in the 1990-1991 season, taking over for MacGregor Sand Knit). So 1992 was the first year they did Olympic jerseys, and that was because it was the first year the Olympics allowed NBA/pros to compete…hence the Dream Team. That made replica Olympic jerseys marketable and a very hot item. For 1988 Olympics, USA basketball was amateurs/college players, and no one would have made jerseys to my knowledge…and no way you could put a name of a college player on the back of a jersey and sell it at retail.And Champion definitely didn’t go back and do a throwback version for the 1988 Olympics. Only Throwback line Champion ever did was the 50th Anniversary collection. So those jerseys are fake.